It is rare for a new course to open in Canada these days, and rarer still that they capture the imagination of the golfing public the way the Links at Brunello has since inviting the public to test this Tom McBroom design in 2015. Maybe that’s because Brunello doesn’t feel like a modern course. In many ways it is a throwback, using tumbling fairways, raised greens, and an intriguing routing to fool you into thinking you’re playing a course that is decades older than you initially thought. Brunello represents the return of Tom McBroom to Nova Scotia, a province in which he had significant success when he opened Bell Bay two decades ago. Brunello is a design that makes maximum use of its land, with McBroom routing holes through dense forest, over more open areas where the fairways roll like the surface of the moon, and around natural ponds. Shifting elevation abounds throughout the course and he did an exceptional job of finding a great mix between shorter, sporty holes like the opener, and big challenging holes that reward strong driving, like the dramatic downhill 11th hole, one of the best on the course. 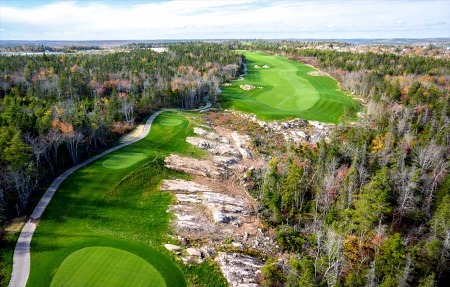 With its location just outside Halifax, near the international airport, it is no surprise that Brunello has captured the imagination of golfers since its open. 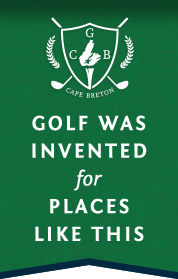 “Canadian Tom McBroom’s design is carved from thick forests amid gigantic granite boulders,” noted Golf Digest’s Ron Whitten, who voted it No. 3 amongst all of the courses that opened in the world in 2015.